Joe Rogan would love to see it though. 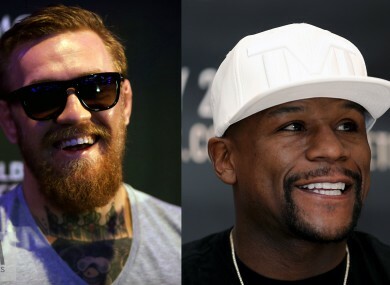 McGregor faces Mayweather in Vegas on 26 August. UFC STAR Conor McGregor would be a “goddam folk hero” if he kicked Floyd Mayweather, according to expert Joe Rogan. The UFC commentator said McGregor would have to be subtle about the way he raised his foot to Mayweather on 26 August, or he’d risk disqualification and a lawsuit. UFC boss Dana White said earlier this month that the fight contract prohibits McGregor from throwing kicks, knees, and performing other mixed martial arts (MMA) moves on Mayweather, such as chokes. Furthermore, under boxing rules, McGregor would likely lose by immediate disqualification if he kicked Mayweather. But that doesn’t mean Rogan isn’t excited about McGregor landing a sly blow. “There’s probably stipulations in the contract where he can’t get him in an armbar or choked him out,” Rogan said on the latest edition of his “Joe Rogan Experience” podcast. Rogan thinks Mayweather would not stand a chance if the fight was on UFC terms. “In an MMA match… McGregor is so much better as a wrestler, submissions, and kicking. He’d hit him with spinning elbows and s***,” he said. “To stop takedowns, to check leg kicks and defend submissions would take years [of practice]. I don’t know what he knows about kickboxing and jiu-jitsu but if he knows nothing, he’d be f*****. As animated as he is about the prospect of McGregor breaking the rules in Las Vegas later this summer, Rogan thinks it would put an end to any other boxing/MMA crossover fights. “It would f*** everything up… nobody would trust anybody from MMA in a boxing match again,” he added. Email “Conor McGregor would be a 'folk hero' if he kicked Floyd Mayweather — but it'd mean a DQ and a lawsuit”. Feedback on “Conor McGregor would be a 'folk hero' if he kicked Floyd Mayweather — but it'd mean a DQ and a lawsuit”.